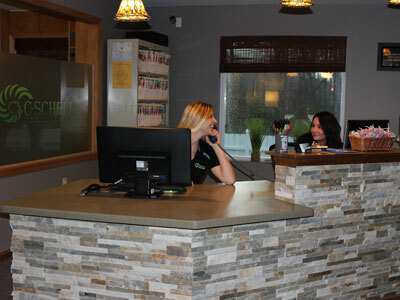 C-Schell Chiropractic offers you a relaxing environment that’ll make you feel comfortable from the moment you step in. Newly redesigned, it’s a modern, beautiful facility. Our chiropractic assistants are ready to greet you and help you get started! The necessary paperwork can be downloaded from our website and brought in completed. You can also fill out these forms once you’ve arrived. Then, you’ll meet Dr. Chris for a consultation to discuss what’s brought you in. If it sounds like you’re a candidate for chiropractic care, we’ll perform a thorough examination. You’ll also receive a chiropractic adjustment and any adjunctive therapies as appropriate. This appointment takes 30-40 minutes. When you return, Dr. Chris will have prepared a full report of his findings from your examination. He’ll detail them to you and ask about how you’ve been feeling since your first adjustment. We’ll discuss our recommendations with you, but your care is always up to you. You won’t be pressured or forced into anything that you don’t want to do. This appointment takes 15-20 minutes. Insurance can be used for your visits, and we are in-network with most plans. Schedule your time with us today!